Gordonsville Town Hall is located at 112 South Main Street, Gordonsville, VA 22942; phone: 540-832-2233. 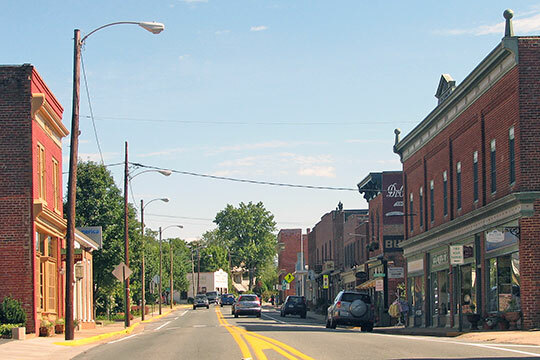 Photo: South Main Street, Gordonsville, Orange County, VA. Photographed by User:Rutke421 (own work), 2008, [cc-by-1.0 (creativecommons.org/publicdomain/zero/1.0/deed.en)], via Wikimedia Commons, accessed November, 2013. Gordonsville, which owed its florescence to the railroad, originated a half-century before the first steam locomotive rolled across Virginia soil. Beginning as a crossroads hamlet, it was named for Nathaniel Gordon, who kept a tavern there in the late 18th century. This tavern was strategically located at the intersection of two major highways: The Fredericksburg Great Road, a stage route leading north from Charlottesville to Orange Courthouse and Fredericksburg; and The Richmond Road, leading west from the state capital through Louisa Courthouse and Swift Run Gap to the Valley of Virginia. Gordon purchased the tavern tract—then known as Newville—from a cousin of President James Madison, in 1787. Gordon's establishment was a typical rural tavern of the time, a place where drovers, wagoners and stage travelers stopped to eat and lodge, and where local farmers came to talk and tipple. The tavern was in operation by at least 1794, and early insurance policies show that the building grew between 1799 and 1805 from a single-story, two-room-plan structure to a commodious multi-story building with three porches, a shed extension, and numerous outbuildings. Prominent guests who lodged or stopped there include Thomas Jefferson, James Monroe and Henry Clay. The Marquis de Lafayette received a "warm and hearty welcome" there from a group of local citizens during his triumphal return to America in 1824. Jeff O'Dell, Virginia Historic Landmarks Commission, Gordonsville Historic District, Orange County, VA, nomination document, 1983, National Park Service, National Register of Historic Places, Washington, D.C.